"Humankind vs. the largest Godzilla ever." Netflix Japan has released an official trailer for the anime movie Godzilla: Monster Planet, which will be available for streaming worldwide from Netflix later this month. Thankfully not long of a wait after opening in Japan in November. Japan's big movie studio Toho produced that new live-action Godzilla movie Shin Godzilla in 2016, and followed it up with this new anime movie. The two could not be more different, with this one being set in the far future. After half-century of the war against gigantic monsters, the human race, deciding to escape the planet Earth for safety, creates a small group to go on a exhibition mission back to the planet. Only to return to a world dominated by Godzilla. The voice cast includes Kana Hanazawa, Ken'yû Horiuchi, Yuki Kaji, and Kenta Miyake. Watch below. Years into the future and the human race has been defeated several times by the new ruling force of the planet: "kaijus". And the ruler of that force is Godzilla, The King of the Monsters. Humanity is in such defeat, plans to leave the planet have been made, and several people have been chosen to look at a new planet to see if it is inhabitable. Realizing it's not, though, the human race resorts to plan B: to defeat Godzilla and take back their planet. 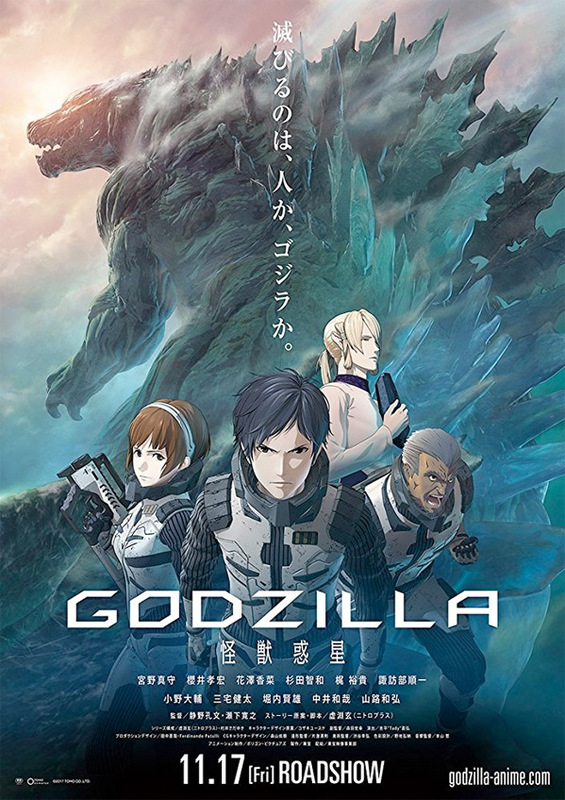 Godzilla: Monster Planet is co-directed by Japanese anime filmmakers Hiroyuki Seshita (Blame!, "Knights of Sidonia", "Ajin") & Kôbun Shizuno (Detektiv Conan, "Knights of Sidonia"). The screenplay is written by Gen Urobuchi, based on an original story by Gen Urobuchi. This first opened in theaters in Japan in November of 2017. Netflix will release Godzilla: Monster Planet streaming exclusively worldwide starting January 17th, 2018 later this month. Who's excited to see this? You down?